This article is about the spice. For the similarly named Luso-Brazilian chili pepper, see Malagueta pepper. For the album by Erik Friedlander, see Grains of Paradise (album). Aframomum melegueta is a species in the ginger family, Zingiberaceae. This spice, commonly known as ossame, grains of paradise, Melegueta pepper, alligator pepper, Guinea grains, fom wisa, or Guinea pepper, is obtained from the ground seeds; it imparts a pungent, peppery flavour with hints of citrus. Although it is native to West Africa, it is also an important cash crop in the Basketo district (Basketo special woreda) of southern Ethiopia. The Pepper Coast (or Grain Coast) is a historical coastal region named after this commodity. A. melegueta is a herbaceous perennial plant native to swampy habitats along the West African coast. Its trumpet-shaped, purple flowers develop into 5- to 7-cm long pods containing numerous small, reddish-brown seeds. The pungent, peppery taste of the seeds is caused by aromatic ketones; e.g., (6)-paradol (systematic name: 1-(4-hydroxy-3-methoxyphenyl)-decan-3-one). Essential oils, which are the dominating flavor components in the closely related cardamom, occur only in traces. The stem at times can be short and usually shows signs of scars and fallen leaves. The average leaves are usually 35 cm in length and 15 cm wide, with a well-structured vascular system. The flowers of the herbaceous plant are described as "handsome" aromatic, with an orange-colored lip and rich pinkish-orange upper part. The fruits contains numerous, small, golden red-brown seeds. A. melegueta pods at a market in São João dos Angolares, São Tomé Island, the fruits are eaten raw in that nation's cuisine and the local name is ossame. Melegueta pepper is commonly used in the cuisines of West and North Africa, where it has been traditionally imported by caravan routes through the Sahara desert, and whence they were distributed to Sicily and the rest of Italy. 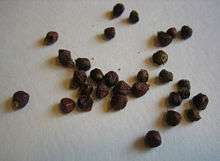 Mentioned by Pliny as "African pepper" but subsequently forgotten in Europe, they were renamed "grains of paradise" and became a popular substitute for black pepper in Europe in the 14th and 15th centuries. The Ménagier de Paris recommends it for improving wine that "smells stale". Through the Middle Ages and into the early modern period, the theory of the four humours governed theorizing about nourishment on the part of doctors, herbalists and druggists: in this context, John Russell characterized grains of paradise, in The Boke of Nurture as hot and moist. In 1469, King Afonso V of Portugal granted the monopoly of trade in the Gulf of Guinea to Lisbon merchant Fernão Gomes, including the exclusive trade of Aframomum melegueta, then called "malagueta" pepper - which was granted by 100,000 real-annually in exchange for exploring 100 miles of the coast of Africa a year for five years. After Christopher Columbus reached the New World in 1492 and brought the first samples of Capsicum frutescens, the name malagueta was then taken to the new chili "pepper". Malagueta, thanks to its low price, remained popular in Europe even after the Portuguese opened the direct maritime route to the Spice Islands around 1500. The importance of the spice is shown by the designation of the area from the St. Johns River (present day Buchanan) to Harper in Liberia as the "Grain Coast" in honor of the availability of grains of paradise. Later, the craze for the spice waned, and its uses were reduced to a flavoring for sausages and beer. In the 18th century, its importation to Great Britain collapsed after a Parliamentary act of George III forbade its use in malt liquor, aqua vita, and cordials. In 1855, England imported about 15,000 to 19,000 lbs per year legally (duty paid). By 1880, the Encyclopaedia Britannica (9th edition) was reporting, "Grains of paradise are to some extent used in veterinary practice, but for the most part illegally to give a fictitious strength to malt liquors, gin, and cordials". The presence of the seeds in the diets of lowland gorillas seems to have some sort of medicinal properties for their cardiovascular health in the wild. As captive lowland gorillas have not had them usually available in their diets, it could be a cause of their occasionally poor cardiovascular health in zoos. Today, it is sometimes used in gourmet cuisine as a replacement for pepper, and to give unique flavors in some craft beers, gins, and Norwegian akvavit. In America, grains of paradise are starting to enjoy a slight resurgence in popularity due to their use by some well-known chefs. Alton Brown is a fan of its use, and he uses it in okra stew and his apple pie recipe on an episode of the TV cooking show Good Eats. They are also used by people on certain diets, such as a raw food diet, because they are less irritating to digestion than black pepper. In West African folk medicine, grains of paradise are valued for their warming and digestive properties, and among the Efik people in Nigeria have been used for divination and ordeals determining guilt. A. melegueta has been introduced to the Caribbean and Latin America, where it is used in religious (voodoo) rites. ↑ 'Grains of paradise' are listed among the unofficial varieties of Cardamum Seed in the 25th ed. of the Dispensatory of the United States of America (1955) p. 257, Paul E. Beichner notes, in "The Grain of Paradise" Speculum 36.2 (April 1961:302-307) p 303. Beichner suggests the miraculous greyn of The Prioress's Tale was grains of paradise. ↑ Several recipes in Two Fifteenth-century Cookery-Books, Thomas Austin, ed, Early English Texts Society, 91 (1888), noted in passing by Beichner 1961, under the names graynys of parise, graynis of parys Graynys of Perys, and simply Graynis. ↑ "Its popularity may have been due to the brilliant name thought up for it by some advertising genius born before his times" observes Maguelonne Toussaint-Samat, Anthea Bell, tr., The History of Food, revised ed. 2009, p. 446. ↑ Noted, with other examples of fiery and watery grains of paradise, by Beichner 1961, p. 304, note 8; cardamom, with which it was often confused, as Cardamomum maius and Cardamomum minus, was reported by Dioscurides as hot and dry in its qualities, as recorded in the late 13th-century Herbal of Rufinus (Beichner, p. 305f). ↑ "O Contrato de Fernão Gomes" (in Portuguese). Archived from the original on 3 December 2013. Retrieved 2006-12-24. ↑ Thorn, Rob. "Discoveries After Prince Henry". Retrieved 2006-12-24. ↑ Guidi Bruscoli, Francesco (2014). Bartolomeo Marchionni, «homem de grossa fazenda» (ca. 1450-1530). Firenze: Leo S. Olschki editore. pp. 92–93. ISBN 9788822263001. ↑ Baynes, T.S. ; Smith, W.R., eds. (1880). "Grains of Paradise". Encyclopædia Britannica. 11 (9th ed.). ↑ "Gorilla diet protects heart: grains of paradise". Asknature.org. February 20, 2012. Retrieved April 18, 2012. ↑ Dybas, Cheryl Lyn, Ilya Raskin, photographer, "Out of Africa: A Tale of Gorillas, Heart Disease... and a Swamp Plant" BioScience, 57 (May 2007) pp. 392–397. Fulltext. ↑ "Apple of My Pie", season 11, episode 15. ↑ Simmons, Donald C. (1956). "Efik Divination, Ordeals, and Omens". Southwestern Journal of Anthropology. 12 (2): 223–228. ↑ Voeks, Robert (2013). "Ethnobotany of Brazil's African Diaspora: The Role of Floristic Homogenization". African Ethnobotany in the Americas: 395–416. doi:10.1007/978-1-4614-0836-9_14. ↑ Moret, Erica S. (2013). "Trans-Atlantic Diaspora Ethnobotany: Legacies of West African and Iberian Mediterranean Migration in Central Cuba". African Ethnobotany in the Americas: 217–245. doi:10.1007/978-1-4614-0836-9_9. Wikimedia Commons has media related to Aframomum melegueta.